This album was huuuuge in 1989. In Canada, summer time is Mitchell time. Cottages, brewskies, BBQ and Mitchell. That’s what it was all about! Shakin’ Like a Human Being was also a huge success for Kim, but he expressed a desire to use less keyboards and programming. Kim recorded in the US this time, and for budget reasons, did not bring along lyricist Pye Dubois with him. Pye had been in the studio with Kim for every album prior, and this caused a rift between the two that took years to heal. This was the last time they collaborated until 1994’s Itch. The pseudo-title track, “Rocklandwonderland” refers to the “concert bowl” at Canada’s Wonderland. “Listen to the music, listen to the voices, listen to my guitar,” sings Kim, although the song is a little light on guitar. “Rocklandwonderland” was a big hit for Kim, and although it’s not a heavy rock, his guitar playing on it is stellar. Perhaps he shouldn’t have followed a slow rock tune with a ballad, although “Lost Lovers Found” is a hell of a ballad, with just a hint of twang. Some felt that Rockland was too soft compared to Kim’s progressive rock past, but a Kim ballad has more integrity than most. Kim’s backup singer extraordinaire, Peter Fredette, is present here and he also serves to class up any song by several notches. The “big” song on the album, still getting airplay today, is the anthem “Rock N’ Roll Duty”. The tougher direction of the song is exemplified by a “live” style music video in a seedy bar. As a fan I really wanted Kim to come out with a tough rocking tune, with a killer chorus, and he did. The phrase “I’m just doing my rock n’ roll duty,” is now commonly heard among music fans in Canada. The song just hits the spot, and the riff is now synonymous for summer in my mind. Other highlights on Rockland include the joyful “The Crossroads” which opens side two. The guitar-heavy “This Dream” is another favourite. I could always identify with the lyrics. It’s just a stellar song, an also-ran that could have been a fourth single. The record is rounded out by “Moodstreet” and “The Great Escape”, two decent but unremarkable tunes. MVP: Drummer Lou Molino, a near legend in these parts. Curiously, when you Google images of Lou Molino, you will also get hits for Lou Ferigno. Overall I was pleased with the direction of Rockland, going a bit more raw and rocking. Unfortunately with the exception of a few tracks like “Rock N’ Roll Duty”, it feels very tame. Except for quirky moments within guitar solos, it doesn’t possess enough of Kim’s humour and idiosyncrasies. It feels as if it’s on a leash, but it’s also not straining to get off it. It feels like Rockland hits the mark in many respects, but plays it too safe. I was very impressed with the “new” Greatest Hits Remixed by Triumph. Normally I don’t go much for remixes, as 9 times out of 10 the original versions are superior. 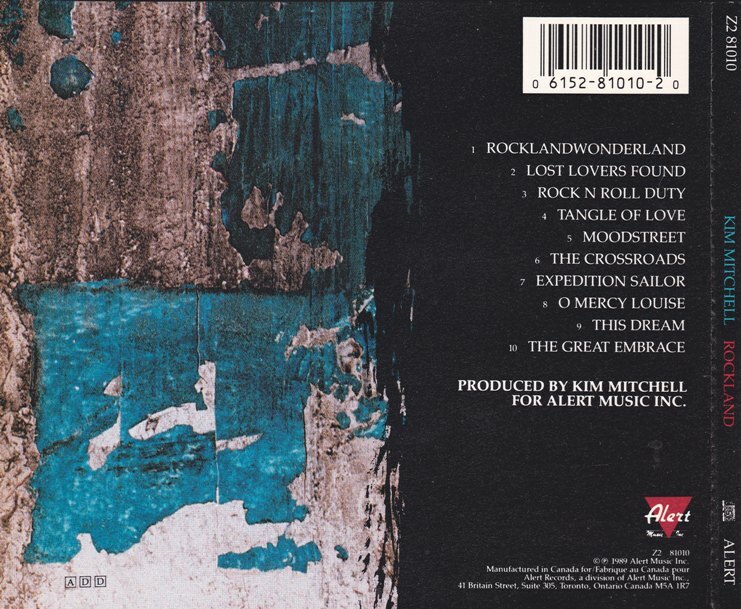 Greatest Hits Remixed however was done by none other than Rich Chycki (ex-Winter Rose) whose credits include remixing work with Rush, particularly on Retrospective III. He did the first remixes of the Vapor Trails material, leading to the band remixing the whole album today. Chycki’s work elevated those songs to a new level, likewise with Triumph. The drums are louder and harder (read: modern sounding). The guitars more aggressive. The rolling, grooving basslines are now in your face. (I may have underrated Mike Levine in the past.) Keyboards have been toned down. Vocals have been stripped dry and place high in the mix. In the case of “Just One Night”, the entire song sounds re-recorded, particularly the lead vocal. Gil sounds older on this version. Even the hokey cheese of “Somebody’s Out There” has been replaced with a new edge, drowning out the formerly keyboard-heavy leanings. My only complaint is that some vocals are a little heavy on echo. This CD-DVD 2 disc set comes with a wealth of interesting extras. The DVD here is a great package on its own, and would have been worth buying in the $10 range alone. Every major Triumph video is here, now backed by the remixed tracks. 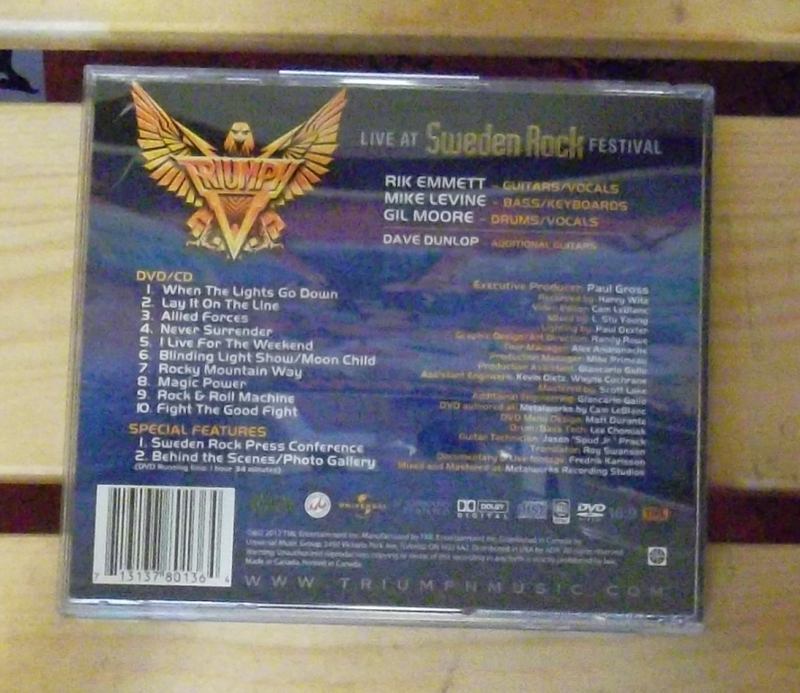 In addition, there’s some bonus features, such as the “Child of the City” music video by the “v2.0” version of Triumph with Phil X. There’s some early fan-cam footage (“Blinding Light Show”) and perhaps best of all, Triumph inducted into the Canadian Music Hall of Fame. They are inducted by Tom Cochrane, introducing Gil Moore as one of his closest friends. Who knew? 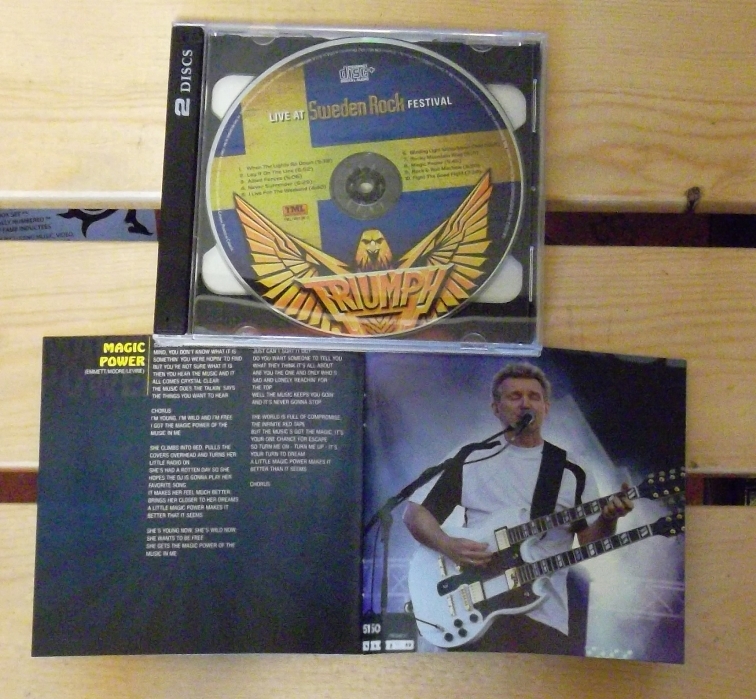 Additionally, the set is housed in a nice double digipack, with lots of photos (a couple recent ones too) and lots of text to read. On the whole, a well made and timely package. 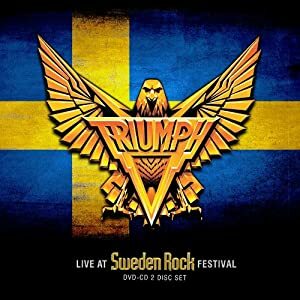 If you’re a new fan who hasn’t got their first Triumph CD yet, this package is a pretty good buy. You might really get into the more modern sound. If you’re an old fan, I think it’s fun to enjoy the memories and the harder rocking sounds.